And… that’s it. It’s one of the least imaginative, repetitive promo line-ups I’ve seen. In my opinion, it rivals 2012’s horrendous terrible promo lineup, and in fact is very similar to that one (2012 offered a baseball cap, backpack, and more t-shirts). 2012’s lineup was so terrible that Tom Garfinkel had to announce a promo item infusion in the 2nd half of the season. Sure, promo items should be viewed as a bonus to catching some admittedly, greatly improved baseball. But, one of the infuriating notes about this mediocre lineup of promos is that the Padres created the false impression that they were interested in hearing the fans’ desires when it came to promos. As Gaslamp Ball reported last season, the Padres held a Social Media Summit that included a white board session for promo item ideas. This brainstorm had some great ideas including Friar robes, beach bags, bullpen backpacks, bobbleheads of past players, etc. You’d think that after polling their most vocal fans that the Padres marketing department might have actually used some of that research and brainstorming to improve the promo lineup. You would be wrong. Each of the Social Media Summit brainstormed suggestions were summarily dismissed, and here we are today, with the most vanilla, boring and underwhelming promotional lineup in baseball. Championship pennant, Bumgarner bobblehead, snow globe, calendar, replica World Series ring, backpack, T-shirt, Buster Posey bank, Hunter Pence bobblehead, Orange Mustaches, Champions banner, Postseason heroes bobbleheads, Socks, and that isn’t even counting the unannounced giveaway items to go along with their host of special event days (Star Wars day, Hello Kitty day, Pixar day, etc.). Not only are the Giants crushing us in the areas of quantity and quality of items, they are crushing us in creativity and innovation. Even the Milwaukee Brewers, a team that is almost the Padres equal in boringness is offering their fans four amazing bobbleheads… JUST FOR SPRING TRAINING. That’s right, Brewers fans in Arizona will be getting Robin Yount, Jean Segura, Hank the Ballpark Pup, and Chorizo bobbleheads. This is just a small sampling. Colorado is giving away four bobbleheads in 2015. The Dodgers announced multiple bobbleheads today. Meanwhile, here in San Diego, we are getting ZERO bobbleheads. What’s that you say? 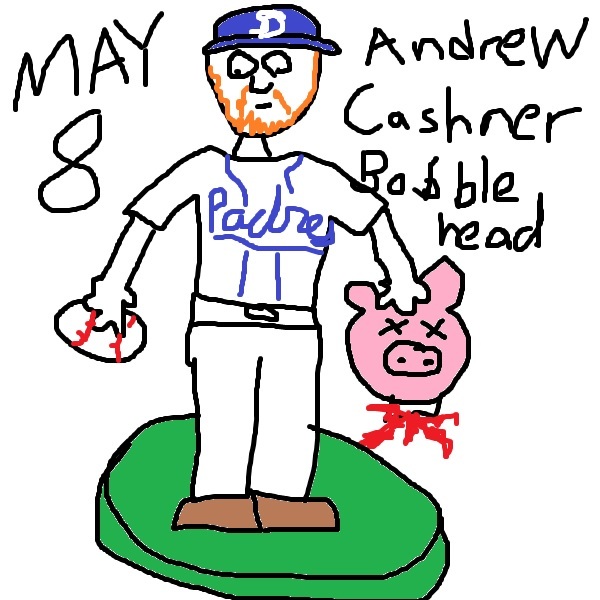 Bobbleheads don’t do well in San Diego. Rick at RJ’s Fro issued a little truth serum to that false claim. The only hope is that the team has a second half surprise of additional and better giveaway items. Until then, much like our uniforms, fans are mired in a promotional schedule featuring nothing but mediocrity. Is it any wonder that this front office lacks the imagination, insight and creativity to develop modern brown uniforms that capture the Padres heritage while pleasing the current fans? These are the same people that sat down and said, hey no need for bobbleheads! Let’s just give out yet another fedora! And on opening day too! UGH. HOW MANY FEDORAS DO WE NEED!??!?!?! With all the apparent improvements in the onfield product, it’s a shame that Wayne Partello and the Padres marketing department struck out with the marketing and promotions for 2015. This was the year to really wow the fans both on and off the field, and the loud groan heard throughout the Padres fanbase when the full schedule was released was not a good sign. Especially considering Partello was handed a huge list of winning ideas at the Social Media Summit that he and the marketing department deliberately ignored. Some things never change.